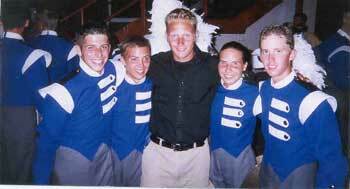 Mike Lack (snoop1466@email.com) submitted this picture of Capital Regiment's cymbal line from 2002. "It was taken on Division II finals night which was by far our best performance of the year. This was my first year in drum corps and I loved it. From left to right are Jimmy Erchek, Steve Givins, Adam Danz (cymbal tech), Carli Berger and Mike Lack." Thanks Mike! E-mail your Forzato submissions -- and we will get to them all, in time -- to dave@dci.org along with where and when the photo was taken. Send some biographical information about yourself as well. We'll give you full credit. Also, let us know if you want your e-mail address included, to get feedback from other drum corps fans.